Got February’s plain socks done by the end of the month, no problem. Haven’t been able to take any photos of them because the grey, rainy days have been making my apartment too dark to get good shots. I did get a couple of shawls that I finished awhile ago finally blocked and looking good. Meanwhile, I’m not sure what to do about this month’s socks. 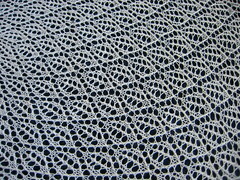 It’s a pattern and yarn that I cast on about a year and a half ago. It’s toe-up and I stopped just before where I believed I needed to start the gusset (I’m not as schooled in toe-up socks as I am top-down). One of the issues is that the yarn I’m using is knitting up at 9 stitches and 14 rows per inch while the pattern is written at 8 stitches and 10 rows per inch. So, I had originally cast on enough stitches to make the sock fit rather than what the pattern called for and now that I’m beginning to do the increases I have a feeling the difference in gauge is going to be a headache. I’m seriously considering ripping the sock out and starting over. If I do that I need to decide if I just want to use the same stitch pattern but knit it top-down (it’ll look different from the pattern as it’s a slipped stitch pattern and the stitches will be pointing in the opposite direction), or I could just pick a new pattern. Right now I’m leaning towards just doing it top-down because I do like the stitch pattern. 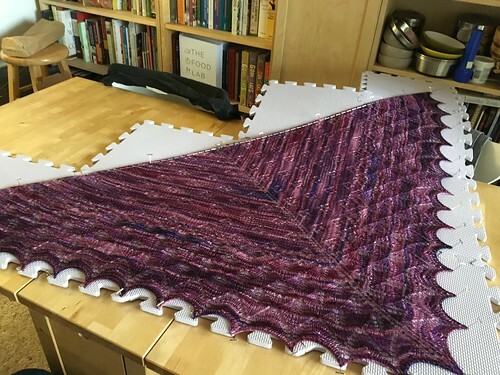 I finished the shawl on Thursday night at about 1 am… so Friday really. I then had to wash it, rinse it, and condition it. I finally finished blocking it at 2:30 am. But, I did indeed get it done in time. I was wrapped Friday afternoon and unwrapped this morning. There was true amazement over how light and airy it looked. We also gave my sister and future brother-in-law a couple of Riedel champagne flutes as Christmas gifts. A little later we decided to give them their wedding gift early… a bottle of 1996 Dom Perignon. The look on my sister’s face was priceless… wish I had had a camera. 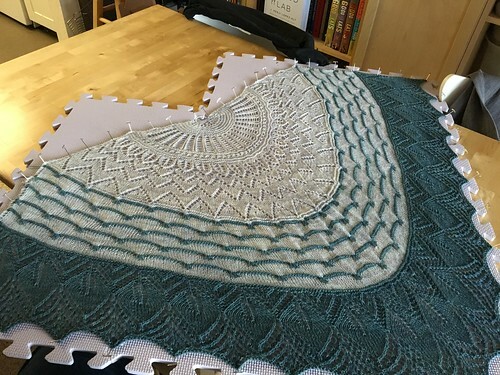 I have been trying to knit fast and furious on the Sister Shawl… I have to have it done and blocked by the 24th, which is when we’ll be driving down to Monterey. Unfortunately, with people staying at my parents’ house and the dog I can’t block the shawl there… of course, I’m not entirely sure how I’m going to block it at my place. 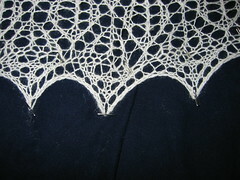 The last lace shawl I dressed I pinned out on a full size bed. I have a queen in the guest room… hopefully, it will be big enough. I’m thinking of using fishing line as I have not had enough time to get dressing wires… okay, so I didn’t remember I needed dressing wires until too late. 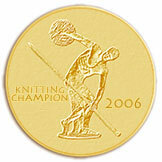 But, fishing line and T pins should do the trick. Although this raises the question of where one goes to find fishing line… huh. I’ll have to figure that one out. 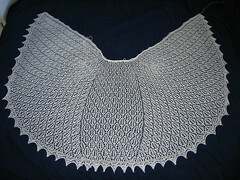 Anyways, the shawl… I’m up to only 116 rows cause I didn’t get half as much knitting done last weekend as I wanted to. I looking forward to tomorrow… I have nothing else I am required to do until 8:30 pm when I’ll be whisked off to a company Christmas party. Thankfully, I picked up my dress on Sunday… very pretty… of course, now my mother hates me. *sigh* She showed me a dress in a catalog by Spencer Alexis… the dresses are mostly flowy things using different types of fabrics in all the same color or nicely contrasting ones. Then, I found out a place in Carmel sells them, went in and tried one on, ordered one in what I believed to be my size, and picked it up a week later. Now, my mother is moaning over the fact that she wanted to get a dress by Spencer Alexis, but now she can’t cause we’d look like twins** even if she got a different style and color (her words, not mine), and what is she going to wear. *sigh* But, with my dress safely in my hands, all I have to worry about is the shawl and if the pins I bought on eBay are going to arrive in time. (I picked out a couple of sparkly pins, both of which are kind of art deco in design, so that I can give one to my sister to help hold the shawl on without needing to worry about holding it or tying it, etc.) I should get at least one before next Friday since it’s already shipped out. Wheee… I am so glad this is not my wedding. *We did the 20 people in the redwoods with a fancy dinner afterward… no dancing… no cake cutting… simple. **People usually think I’m either my mother’s clone or her younger sister we look that much alike. Clone I don’t mind… but sister? Granted my mom is only 20 years older than me… I should just be happy that no one believes what age she is and that I got those genes.